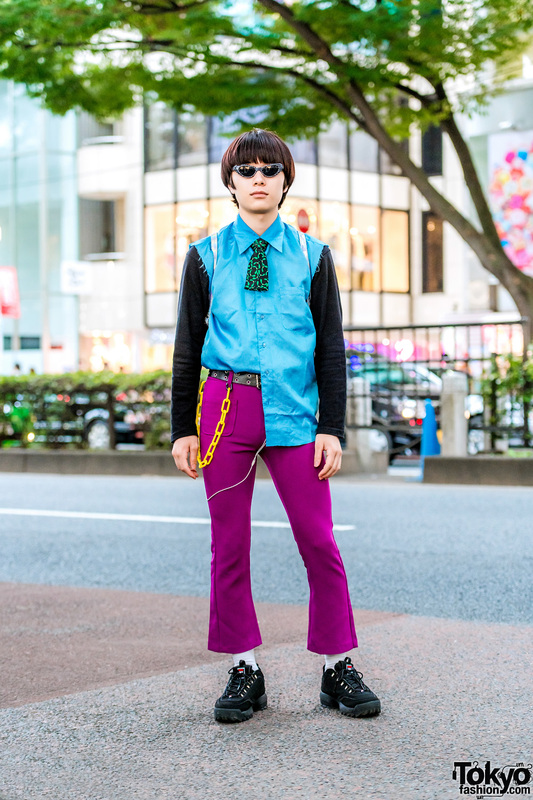 Harajuku guy in a retro vintage style with black sweatshirt, aqua shirt, cut-off necktie, purple flared pants, black sneakers and alien backpack. Kinji Shimokitazawa staffer showcasing a colorful mixed print street style while out and about on the street. Japanese singer, Asachill in Harajuku sporting a fun punky outfit with an Emily The Strange hoodie and leather jacket. Harajuku teens sporting modern polka-dot street dressing while out on the street one afternoon. Harajuku girls in vintage lace and ruffle fashion styles while out and about the neighborhood. Harajuku guy in black and white street style with cropped blazer over collar shirt, polka dot pants, black boots, and silver hoop earrings. Short haired Harajuku girl wearing a John Galliano printed blouse with puff sleeves, black pants tucked into mid calf heeled boots, a wicker handbag, a scarf and suspenders. 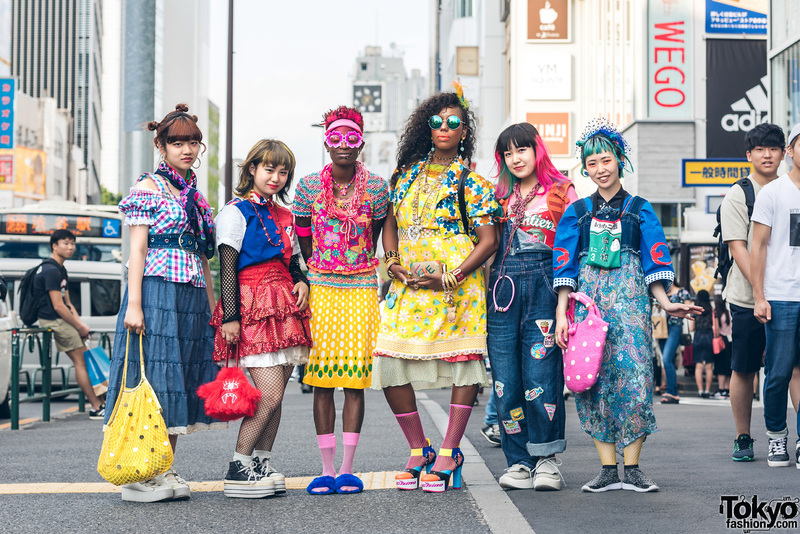 Colorful vintage fashion worn by heARTofCOOL and styled by Fanatic Tokyo Magazine on the street in Harajuku. 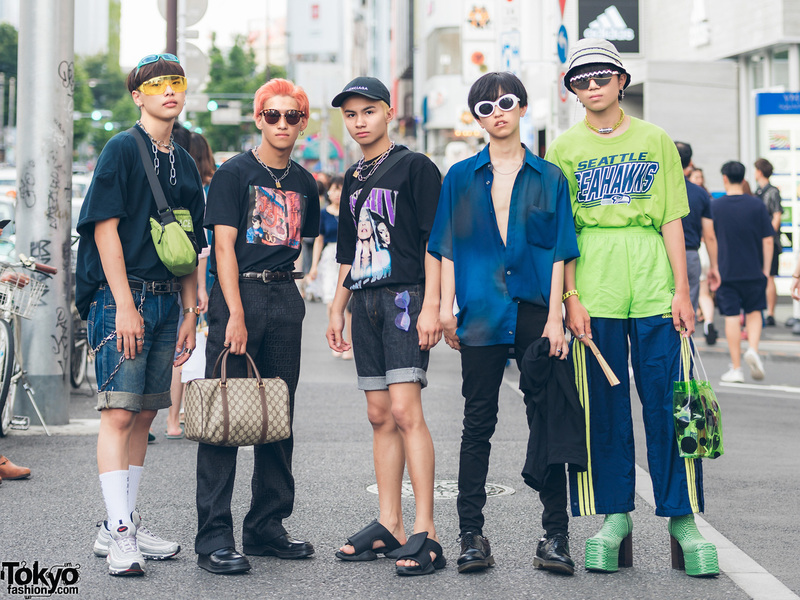 Harajuku guys in streetwear fashion with vintage items, t-shirts, pants, skinny jeans, denim cuffed shorts, button down shirt, track pants, sneakers and black shoes.